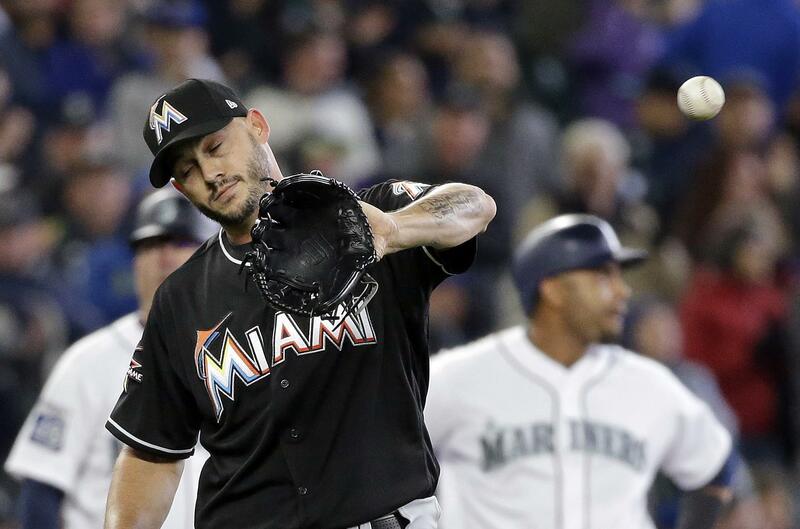 What happened: Mitch Haniger and Kyle Seager drove in four runs apiece and the Seattle Mariners roughed up the Miami Marlins 10-5 to take the rubber match of a three-game set at Safeco. The Mariners now embark on an 11-day, 10-game road trip through Oakland, Detroit and Cleveland. Haniger went 3 for 4 with a walk, a double and three runs, while Seager went 2 for 3 with two walks and a double. Starter Felix Hernandez was serviceable, allowing four runs on 12 hits and his first walk of the season with five strikeouts, and got out of a couple of jams via timely defensive plays. Marlins starter Edinson Volquez and reliever Dustin McGowan both gave up four runs as the Miami staff gave up 11 hits and issued 10 bases on balls. Marlins 2B Dee Gordon led the game off with a routine grounder to first past Mike Freeman, who was drawn in guarding against a bunt. The M’s then got unlucky, with Martin Prado singling past Robinson Cano, who was moving to cover second on Gordon’s steal attempt. Christian Yelich singled to score Gordon and Giancarlo Stanton’s groundball single loaded ’em up. Justin Bour flied to left for the first out, and Jarrod Dyson’s throw home nabbed Prado without a play, or the inning would have been even bigger. Hernandez allowed an RBI single to Marcell Ozuna, then hit J.T. Realmuto before coaxing a grounder to third by Miguel Rojas to mercifully end a long first inning at 21 pitches. The Mariners threatened in the bottom. Mitch Haniger drew a one-out walk and Cano singled behind him. After Nelson Cruz struck out, Kyle Seager walked to load the bases for Taylor Motter. Volquez gifted the M’s a run with a wild pitch but Motter then flied out to end the potential rally. Volquez loaded the bases again with one out in the second on a ground-rule double by Mike Zunino and walks to Leonys Martin and Dyson. This time, Haniger came through with a big blow, a slashing line drive to right that plated two – which also extended his hitting streak to 13 games. The inning ended on an attempted double-steal double play, with Cano called out on strikes and Haniger caught stealing at second. M’s got to Volquez once again in the third on back-to-back doubles to start the inning by Cruz and Seager. But again, M’s lose a runner on the bases as Seager was picked off straying at second by the catcher Realmuto. The bats stayed hot against reliever Dustin McGowan in the fourth, reaching him for four more runs. Haniger plated two more with a scoring double to center and Seager delivered a two-run single to break it open. Yelich tagged Hernandez with a no-doubter on a hanging slider in the fifth. The King then walked Stanton – his first free pass of the season – prompting a visit from pitching coach Mel Stottlemyre. Stanton went to second on a wild pitch, then Hernandez got a nifty defensive play behind him to end the inning. Realmuto beat out an infield single, but Freeman reacted quickly and nailed Stanton trying to score on the play. Hernandez was dominant in the sixth. coaxing a pair of groundouts from the 8-9 hitters and getting Gordon to flail wildly for strike three. In the seventh, the M’s ace got another groundout before allowing Yelich’s opposite field ground ball single, and manager Scott Servais came out for him. The Mariners loaded the bases yet again in the eighth against reliever A.J. Ramos, usually the Marlins’ closer. Haniger singled before Cano and Cruz earned free passes. After a visit to the mound, Ramos walked Seager to force in a run. Ichiro, in perhaps his final at-bat at Safeco, in the ninth inning deposited a homer into the first row in the right field bleachers, to the delight of everyone still at Safeco. Ichiro became the oldest (43) player in the bigs to homer since Julio Franco (48) in 2007. You take what they give. The Marlins have been the beneficiaries of three starts that took no-hitters into the late innings in the past week or so, but all five pitchers that took the hill had trouble finding the mark. Haniger took full advantage, extending his hitting streak to 13 games and continuing to impress in his first full season in the bigs, bumping his early-season average to .323 and OPS to a gaudy 1.029. Hero: Mitch Haniger. He’s been the team’s MVP to this point in the season. Not bad for a “throw-in” to the Jean Segura deal. Goat: Dustin McGowan. The Marlins reliever took over after their starter was ineffective after three innings. Only problem: McGowan was worse that Volquez. Seattle Mariners at Oakland Athletics on Thursday at 7:05 p.m. at Oakland Coliseum. LHP James Paxton (2-0, 0.00 ERA) vs. RHP Cesar Valdez (0-0, -.— ERA). Haniger’s hot bat is finally starting to garner some attention, maybe not around here – where he’s been a marvel since the season started – but nationally. … Seager is also starting to heat up. … The M’s strong homestand may show they are more resilient than thought. And it gives fans a bit of hope. … Ichiro has a flair for the dramatic, doesn’t he? … The Marlins are on the market and some big names seem to be involved in the conversation. Published: April 19, 2017, 4:30 p.m. Updated: April 19, 2017, 5:16 p.m.